Mattresses provide the foundation for sleep and play an essential role in our spinal health. Choosing the right one can make all the difference when it comes to comfort and correct body support. Hybrid mattresses have recently received a great deal of attention among customers. They are designed to offer sleepers the best features of other mattress types while minimizing the negatives. The Avocado mattress is an 11″ hybrid mattress combining natural latex and pocketed coils. It consists of 3 layers and is available either with or without an additional pillow-top option. 1″ Transition Layer – This layer is 1″ of the high-density Dunlop latex, which makes it slightly firmer and provides a transition between the upper comfort layer and the coil support layer. 8″ Foundation Layer – This layer is 8″ of individually pocketed innerspring coils (up to 1303 in the largest mattress) that provide the underlying support to the mattress. The coils are arranged in zones for greater comfort with 3 distinct areas to provide support where it is needed most. The cover of the Avocado mattress is button-tufted and made up of 100% organic cotton and Joma New Zealand antimicrobial wool. It is soft to the touch, breathable, it provides a luxurious feel and helps with temperature control. Besides this, the Avocado mattress has hand-sewn upholstered handles on its sides for easier moving or rotating. Its pocketed coil foundation layer provides good support, whereas the top latex layer provides more of a sensation of floating that is a specific characteristic of latex compared to the feel of memory foam. The latex will not provide you with a feeling of deep hug felt with layers of traditional memory foam, but it offers a good contouring and the mattress is suitable for all sleeping positions. As for comfort, the Avocado mattress is a rather comfortable one. The coil base foundation provides your body with a good support while the top comfort layers provide you with a good contour. It offers nice bounce and a high degree of pushback and response. Although latex may not provide you with a feeling of deep hug offered by memory foam, with time it will adapt to your body and become a lot more comfortable. The Avocado mattress has a minimal sinkage with the latex and coil construction doing an excellent job in providing the support and pushback. 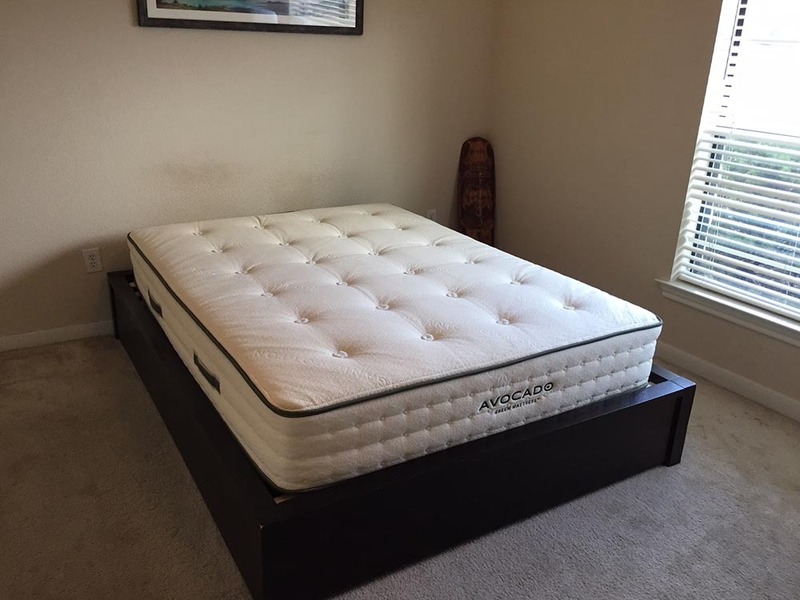 It offers solid edge support and eliminates the feeling of “rolling off“ of the mattress. The Avocado mattress doesn’t have any noticeable smell upon opening the box which is the result of the organic design and build of the mattress and the absence of foam in the construction. Therefore, it gets high marks in this category. The Avocado mattress is priced higher than many of the mattresses we have tested. It comes in at $1399 for a Queen which makes it a little pricier than foam mattresses, but less than all latex mattresses in general. However, this is a great price for a high-quality organic mattress, and it is surprisingly low given the luxurious materials included. 2″ Support / Cooling Layer – This layer is 2″ of 2.5lb gel infused memory foam that provides additional support and reduces heat retention. The cover is made from phase-change regulating material with breathable open weave, and a smooth and soft finish that adds to the comfort and airflow. Tomorrow Sleep comes in two firmness options and the Medium Soft model we tested scores 5-6 out of 10, with 10 being the firmest. Its top comfort layer provides a soft luxurious feel, and the underlying coils and foam provide good support underneath which makes this mattress ideal for heavier sleepers. The Tomorrow Sleep mattress offers good support in all sleeping positions. It provides you with enough give in the top comfort layer to support your hips and shoulders and with enough firmness when you switch to your back or stomach. 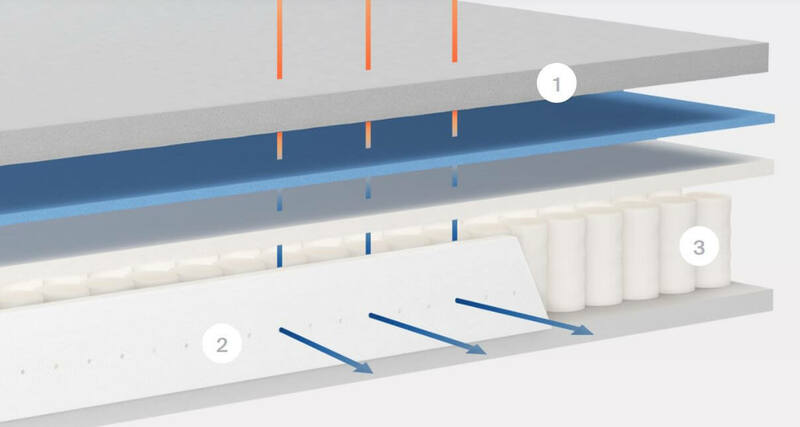 The Tomorrow Sleep, unlike Avocado mattress, does a good job in reducing heat due to the gel foam layer in the top comfort layer combined with the phase-change material in the covers. The nature of its innerspring coils allows good airflow, and the perforated edge panels around the coils contribute to this. The Tomorrow Sleep does a good job with minimizing sinkage although it is only 10″ in height. Although my partner Andrew did compress the mattress when sitting up, he did not come to rest on our foundation below the mattress. The support coils kept this from happening and prevented me from rolling into him which often happens with less supportive 10″ mattresses due to our weight disparity. The edge support layer incorporated within this mattress provides good edge support. As it is a hybrid coil mattress, it has a certain degree of motion transfer, but nothing too extreme like it is the case with some competing beds. Below is our comprehensive side-by-side comparison of the Avocado vs. Tomorrow Sleep mattress. Memory foam feel – Memory foam top layer of this mattress provides a good contour to your body and gives you a feeling of body hug which is typical for memory foam.